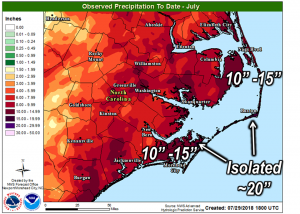 With some locations receiving up to 20″ inches of rain and most of that falling in the last weeks of July, I guess that explains what happened to summer…rain. Vacationers were not happy, parents with young kids were not happy, those of us without kids were not happy, heck even our puppies were not happy. This crazy weather pattern brought dangerous rip currents, shifting sand, some ponding of water (which some chose to play in, I did not), downpours so hard the satellite went out, oh and should I mention a roof leak for us. Gah! Things have finally settled down with less dangerous water conditions, sand returning to it’s normal location and lowered frustrations for parents. It appears we need to make the most of every beautiful day with beach time, pool time, water park days and just maximizing this last month or less of summertime goodness. The cruise control is off and we’re speeding toward Labor Day and pumpkin spice everything. How’s your summer to-do list looking? I imagine buying or selling an Outer Banks home is on that list, somewhere after take “Jimmy” to the waterpark. No matter whats on your list, we hope you make the most of these beautiful sunshine-y summer days. *graphic provided by the US National Weather Service Morehead City/Newport Facebook page.